This USB Mini desk Fan provides personal cooling at home or in the office. ,equipped with two motors driving different blades rotating in opposite directions to produce the maximum blow with the minimum power consumption and the lowest noise. Our USB Desk Personal Fan is perfect for providing cooling relief during the hot and humid summer months.This fan is ideal for desk or tabletop use.With 2 powerful speed settings, wide area coverage, and a lightweight, stylish, easy portability and compact design, this fan is ideal for use in a living room or bedroom. The tilt adjustable head allows you to direct airflow where you want it. Tilt-adjustable head allows you to direct airflow wherever you want it. 1.This USB mini desk fan is originally designed, made of high-quality ABS plastic. 2. Equipped with two motors driving different blades rotating in opposite directions to produce the maximum blow. 3.Power saving: the power consumption is very small:1-weak 0.7 watt 2-strong 1 watt. 4.Super quiet: 1-weak 26dB, 2-strong 36dB. 5.Small size and light weight: Size: 3.8*2.8*5.3 inch, weight: 0.42LB. 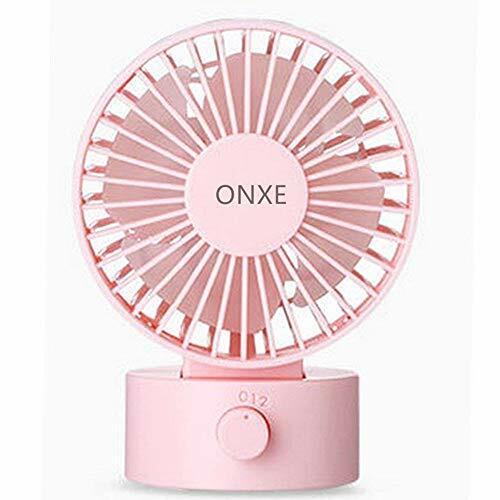 *1 x double Blade USB Mini Desk Fan. Ideal desk fan:Desk USB Fan made of high-quality ABS plastic.Two fan blades rotate in opposite directions driven by different motors to blow cooling & soft wind. Adjustable and Easy to clean:Tilt adjustable head allows you to direct airflow where you want it. Removable rear grille for easy cleaning.Simple and safe operation.